It’s still early days some would say but three games into the Euros and it is very glaring that France boss Didier Deschamps has major decisions to make concerning his French side. Yes, they have qualified but performances have been way below par for a side that were expected to light up the tournament not just because they are hosts but because of the level of quality inherent in the side. The mere fact that they had to rely on late goals against opposition they were tipped to run over (no disrespect to Romania and Albania) and a barren draw against Switzerland says it all. The French defence looks solid enough and Ngolo Kante has done an excellent job protecting the back four, but the main problem is going forward. Dmitri Payet aside, the French midfield and attack look clueless to say the least. In the first game against Romania, Deschamps played with a midfield trio of Ngolo Kante, Blaise Matuidi and Paul Pogba – a midfield combo with power and all but it didn’t work for France. The front three of Dmitri Payet, Antoine Griezmann and Olivier Giroud lacked that spark that we’ve seen in recent times. Antoine Griezmann could be cut some slack considering the tedious season he just had with Atletico. 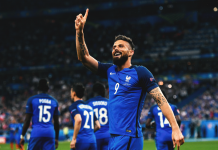 Payet tried to make things happen, dropping deep to create for his teammates but Olivier Giroud; even though he scored the winning goal was terrible on the night and aerial prowess aside, he offers nothing. 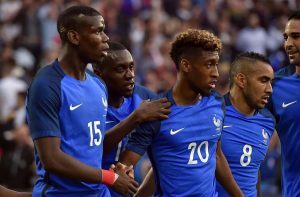 For the Second group game against Albania, Didier Deschamps dropped Pogba and Griezmann for Kingsley Coman and Anthony Martial. Considering the impact these two had as substitutes against Romania, it seemed like a sensible move. The first half was an eyesore as the Les blues did not even have a shot on target. Manchester united Youngster Anthony Martial who failed to impress having only 10 passes, 1 take on and one shot with 0 chances created and was promptly removed at halftime. Things improved slightly in the second half but France still lacked that cutting edge. Olivier Giroud was once again a major culprit having 5 shots with none of them hitting the target. Kingsley Coman was the liveliest of the front three making good attacking forays into opposition territory trying to make things happen. The decision to bring in Andre Pierre Gignac and Antoine Griezmann later on paid off as both played major roles in the 2 goals scored with Griezmann scoring the first and Gignac assisting Dmitri Payet’s goal albeit from a slip after a delightful pass from Paul Pogba in a swift France counter. As it stands, the only players guaranteed of starting for France in midfield and attack based on performances so far are Ngolo Kante, Dmitri Payet and to some extent Antoine Griezmann. 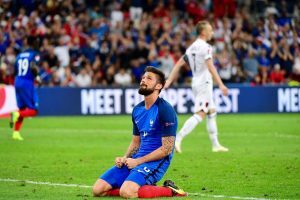 Giroud should obviously be dropped, but then who replaces him? Griezmann? Andre Pierre Gignac? Should Paul Pogba be dropped? What happens to Anthony Martial? Another chance for the United man? Does Kingsley Coman deserve a starting spot? A 4-3-3 or a 4-2-3-1? These are all questions Coach Didier Deschamps has to answer and he needs to answer them now as any form of experiment in the knockout phase could cost France.